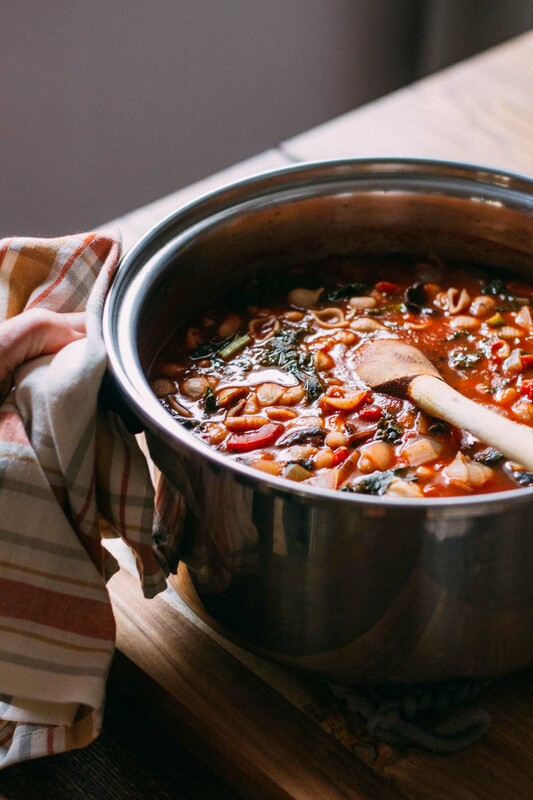 Cannellini Kale Noodle-y Soup is a one-pot wonder that tastes as if you’ve spent an afternoon in the kitchen when you’ve spent less than a thirty minutes! This tremendously tasty noodle-y soup slash stew is ready in a flash while delivering rich, slow-simmered, must have fussed for hours, (whew) flavor! 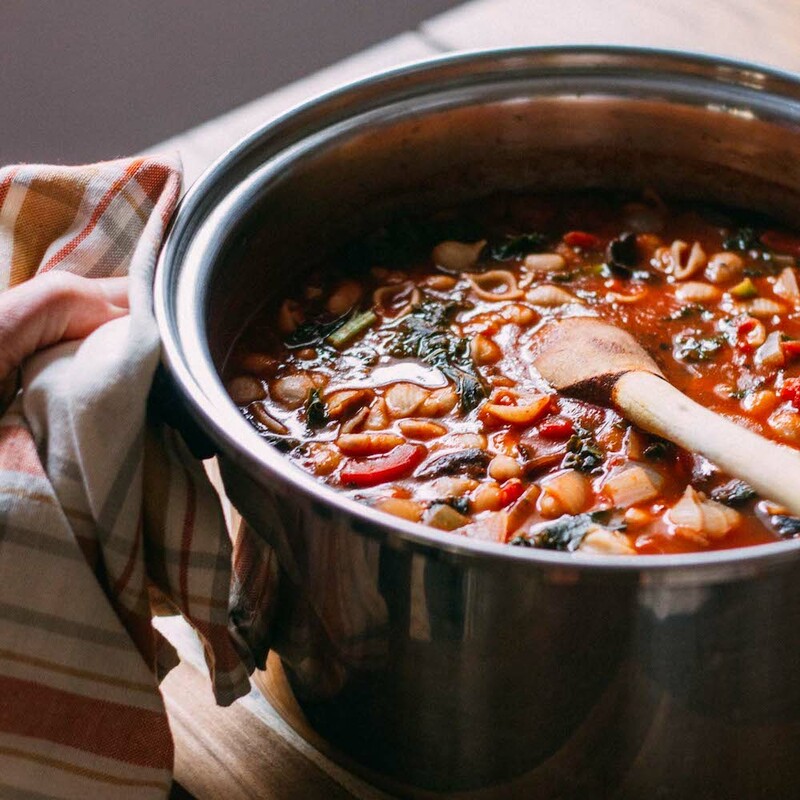 Not to mention, there’s a bit of magic in this recipe for Cannellini Kale Noodle-y Soup. The magic I’m referring to comes from a couple of tablespoons of miso paste. If you aren’t familiar with it, miso is a big time saver for the time-crunched cook. Miso is a paste made from fermented soybeans and barley or rice malt common in Japanese cooking and used to create umami. Umami refers to savory taste; it is one of the five basic flavors together with sweetness, sourness, bitterness, and saltiness. A few words I use to describe miso paste are salty, fishy, or even nutty, but those words do not completely cover all the levels of flavor created by a scoop or two of miso. Equally important, let’s move on to the rest of the lovely ingredients in this one pot noodle-y wonder called, Cannellini Kale Noodle-y Soup! The rice noodles keep this soup gluten-free, which makes it easy to share with other soup lovers. Plus, noodles make dinner fun for the little ones. Heck, I probably enjoy the noodles as much as any five-year-old; who am I kidding? 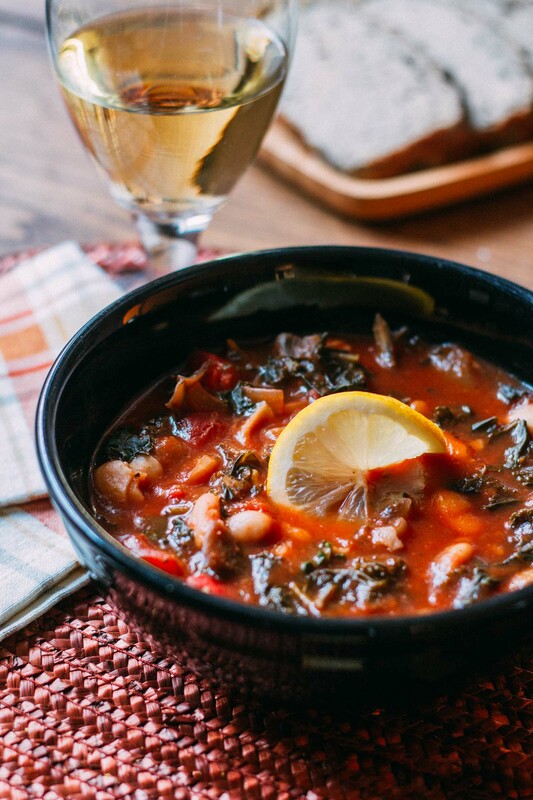 The cannellini beans offer a nice bump of protein making this soup an excellent idea for dinner, baby! Regarding the kale. Ah, kale. Don’t even get me started on how fabulously nutritious kale is or how we all need more greens in our diet each day or how practically perfect kale is because I LOVE kale!!! 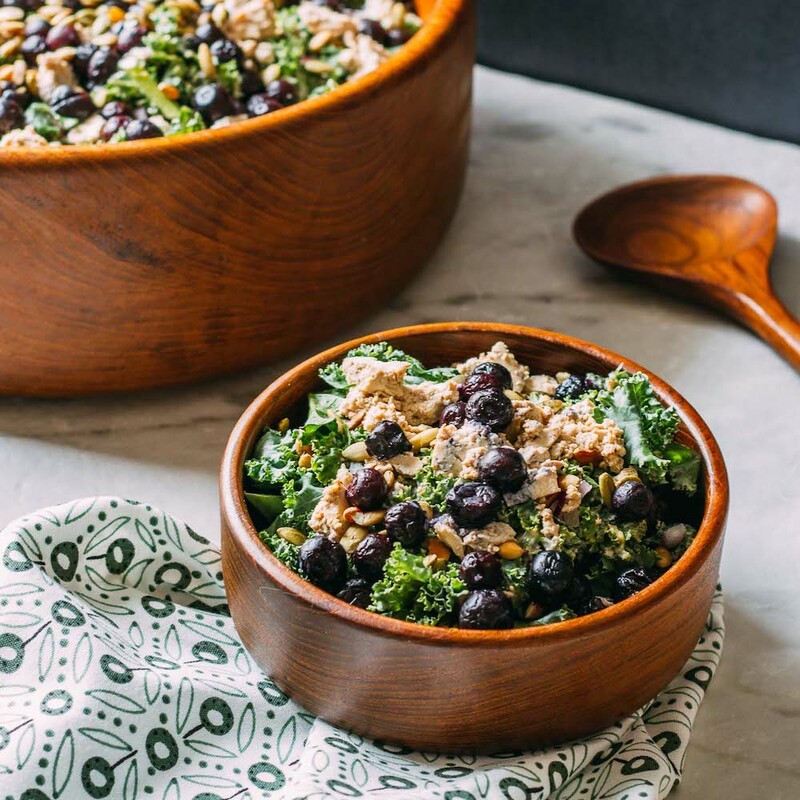 Kale is a lusciously nutritious and affordable leafy green that provides protein, and it’s power-packed with vitamins A, B, C, and K as well as folate, lutein, and calcium! As a matter of fact, B vitamins and vitamin C promote iron absorption and are essential for the release of energy from food. Additionally, Kale is high in fiber and water which help prevent constipation and promote regularity and a healthy digestive tract. You can’t say I didn’t warn you; I sincerely appreciate me some kale. Kale, yeah! 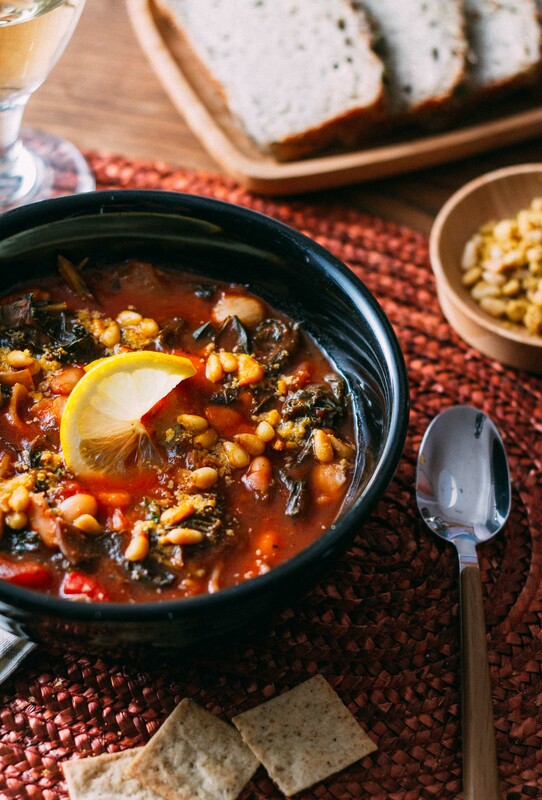 Topping this soup off with a bit of our homemade Plant-Based Pine Nut Parmesan will take your Cannellini Kale Noodle-y Soup to the next level. Talk about umami, pine nut parm brings it by the boatload, and it takes about five minutes to make. So, by all means, do yourself a huge favor and make a quick batch of dairy-free parm! Be sure to pin this recipe to save it and share it with your friends. And when you make a pot of Cannellini Kale Noodle-y Soup, leave a comment. I’d love to hear how it goes! Cannellini Kale Noodle-y Soup is a lite yet comforting soup that is full of kale, mushrooms, and noodles. It’s perfect for lunch or dinner any time of the year! Better still, you can freeze leftovers in individual containers to use as you need for up to 6 months. Now that’s what we call make-ahead and handy! And a generous sprinkle of our Plant-Based Pine Nut Parmesan tops this soup off like something you’d savor at your favorite bistro! 8 oz of dried pasta prepared according to the package instructions - We use gluten-freeTinkyada or other rice noodles. two cans of fire roasted tomatoes or regular diced tomatoes - We love the flavor of this brand! 2 tbsp of miso, or a vegetable stock paste - We prefer this organic, gluten-free variety of miso. First, prepare noodles as directed on package. Rinse, drain and set aside. Second, heat a large pot over medium heat, and add a splash of water or broth to coat the pan and then add the chopped onion. Cook the onion for 5 minutes, stirring frequently, or until the onion becomes soft. Add water or broth as needed to prevent the onions from sticking. Now add the minced garlic and cook for another minute, or until the garlic releases its fragrance. Add the chopped mushrooms and cook for another minute or two. Next, add the tomatoes, tomato paste, miso, vegetable broth, and rinsed and drained cannellini beans. Bring the mixture to a low boil. Reduce the heat to just warm enough to support a slow and low, simmer. Add the kale to the pot and cover. Covering the soup allows the kale to steam as it sits above the rest of the ingredients in the pan. Simmer, covered, for about 5 minutes. Once the kale has wilted down a bit, stir the soup and continue cooking for another 10 minutes or so, or until the kale is tender. Stir in the salt, black pepper, red pepper flakes, and nutritional yeast. Taste to adjust the salt and pepper as needed. Note that you can opt to add an extra cup of water or broth if you prefer that the soup needs a bit more liquid. This versatile nutritious and tasty veggie soup can be stew-like or soupy, depending on how you prefer your soup. Next, add the prepared noodles to the soup. Hit your homemade soup experience out of the park by topping it off with herbs - parsley or cilantro or both. 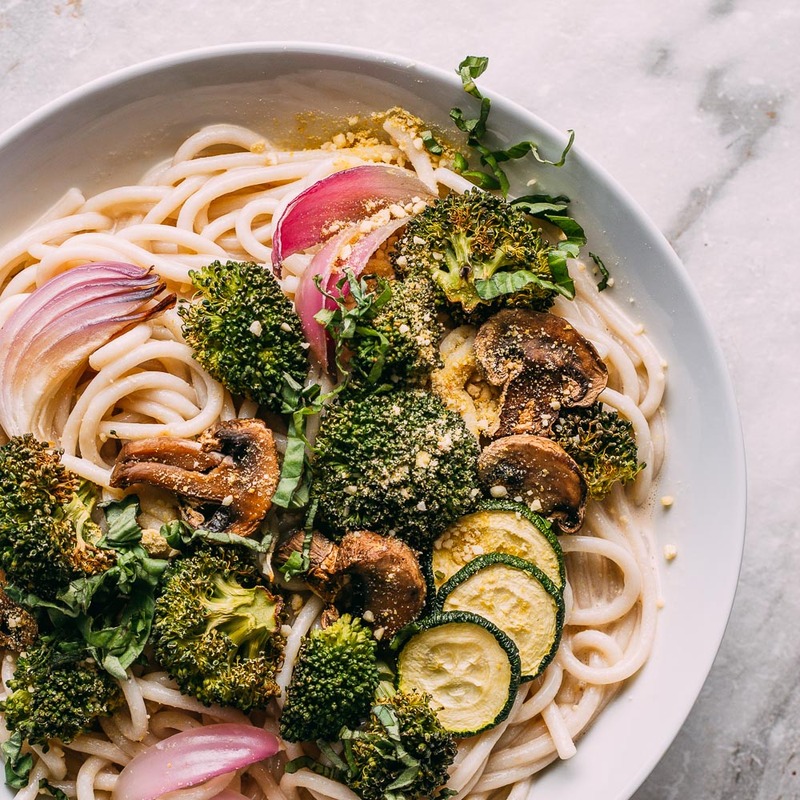 And last but not least, a lite squeeze of fresh lemon juice and a generous sprinkle of our Plant-Based Pine Nut Parmesan tops this soup off like something you'd savor at your favorite bistro! 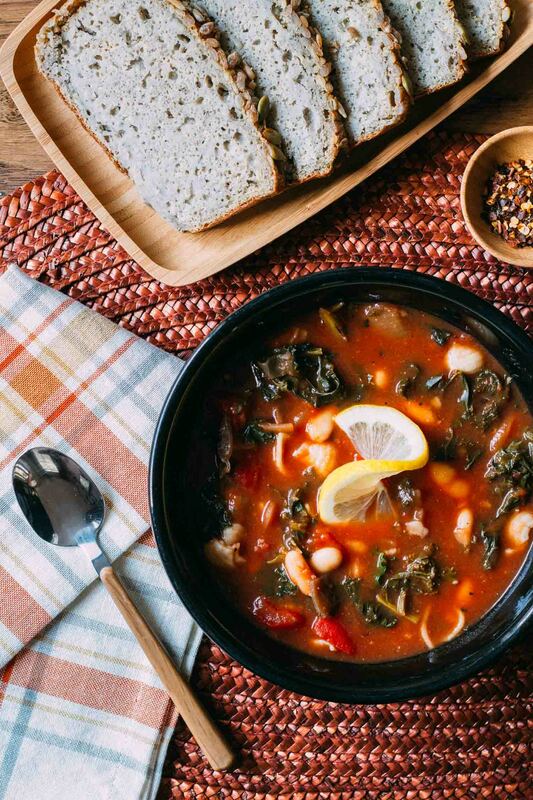 Serve your delicious homemade soup immediately and enjoy along with some crispy crackers or a slice of your favorite crusty bread. This hearty soup is also a wonderful make-ahead lunch. Miso is available to order on Amazon using the clickable ingredient link above or often found in the refrigerated vegan produce section of many well-stocked grocery stores and Asian markets. As an alternative, sub in a quirt or two of Bragg's Liquid Aminos or a bit of Tamari to add another level of flavor to the soup. As written, this soup is intended to be family-friendly. If the soup needs a little more heat for your liking, go heavy on the red pepper flakes. You could also stir in a smidge of cayenne pepper! As always, if you are following a gluten-free diet, make sure you check the labels of commercial broths to be sure they meet your requirements. Likewise, the same is true for any packaged ingredient. When following a restricted menu, carefully reading labels is a must. 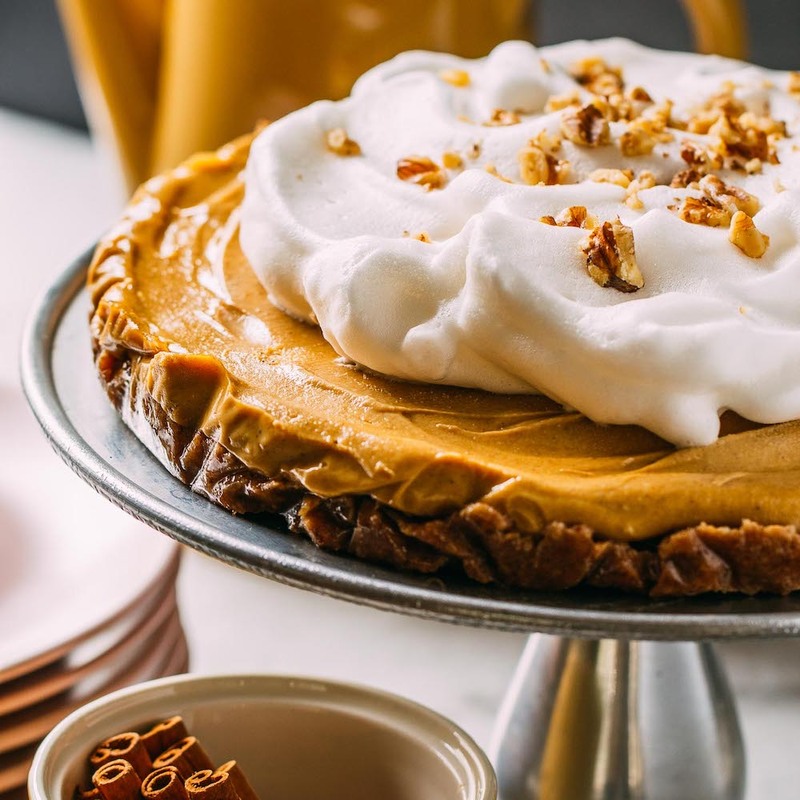 Finally, the nutrition information provided is based on the entire recipe divided into eight portions and does not include optionally suggested additions. Please go back and update all the directions. I had to guess at when to add the tomato paste, miso, pasta, red pepper, parsley & cilantro AFTER I reached the end of step 3. Mine turned out tasty, but I left out the parsley & cilantro b/c I didn’t have fresh and I wasn’t sure others would like those flavors…the kale was pushing it with my husband! Thank you for taking the time to call my attention to my miso error, Carol. Since we’ve already chatted via a Facebook group, I know that you are happy with the updated, edited recipe. And, by the way, I’m so glad to hear that your soup turned out tasty… that’s what it’s all about!